So it’s February 2015 and throughout my Facebook feed there are many mentions of famous and not so famous men and women who have contributed to the greatness of these United States. People like Langston Hughes, one of my favorite writers of all time and Nina Simone. I love reading about these people and those that I am less familiar with, I just hate the fact that we don’t really pay attention to their accomplishments until February. The most astonishing discovery I had this month had nothing to do with my Facebook feed, instead I was working on a project for my paternal family reunion when I came across the document pictured below about my maternal grandfather. Request for a headstone for Frank Walker Goolsby, my maternal grandfather. What makes this document so fascinating and causes me to stick my chest out with pride is the space for Medals. Can you see that? My grandfather was awarded a Purple Heart! Now how cool is that? I think it is pretty darned awesome. The Purple Heart is awarded in the name of the President of the United States to any member of the Armed Forces of the United States who, while serving under competent authority in any capacity with one of the U.S. Armed Services after April 5, 1917, has been wounded or killed. Specific examples of services which warrant the Purple Heart include any action against an enemy of the United States; any action with an opposing armed force of a foreign country in which the Armed Forces of the United States are or have been engaged; while serving with friendly foreign forces engaged in an armed conflict against an opposing armed force in which the United States is not a belligerent party; as a result of an act of any such enemy of opposing armed forces; or as the result of an act of any hostile foreign force. 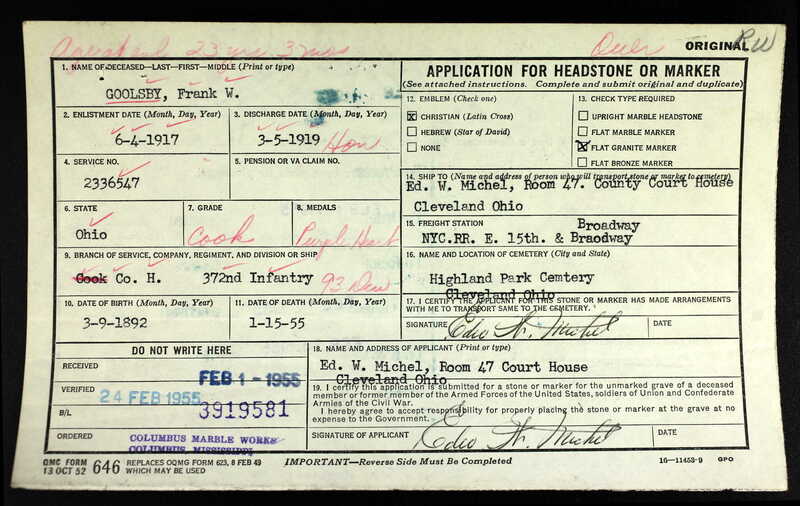 Now this document lists his grade as “cook”, so not only did he work to keep our soldiers fed during this tumultuous time, but at some point he was involved in combat and carried the wounds for the rest of his life. This is the best Black History month “present” I have ever received. I never had the pleasure of meeting him, but the fond memories my Mom had of him linger in my heart and have grown stronger with this knowledge. Now I can’t wait to find out more about him, because there are still a lot of questions.